The batch 2016-20 visited ‘Amaltari Home Stay’ on 18th November, 2016 to collect field information through social interaction with the Tharu community. The visit intended to cover the practical curriculum of four core subject’s i.e. Organization and Management, Sociology, Psychology and Economics. The students were warmly welcomed by the manager of the home stay and asked to feel like home during the stay. The students were allocated twenty different homes which served local cuisines throughout their stay. The major objective of this visit was to familiarize the students with a local community and let them observe how different aspects such as money, culture, family affected one’s behaviour and thoughts. The hosting family of the home stay program where different teams resided overnight was the sample households for the interaction and collection of information on three subjects. The survey took place in two phases; one being interviewing the family members with 8-10 questions and another was observation. 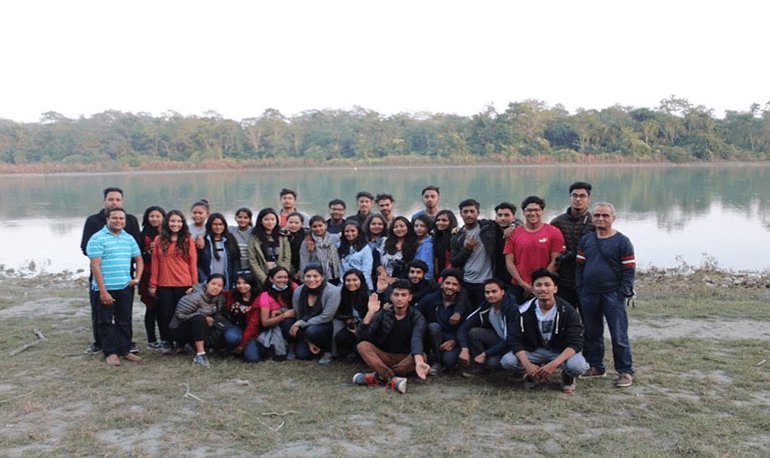 The students also visited two major Tharu lodges ‘Tiger Tops’ and ‘Tiger Temple ‘where the respective managers gave an insight of their management structure. They also shared how planning tools, sales and purchase management ideas, division of labour, inward- outward communication etc took place in their lodges. The students not only fulfilled their academic requirements but also got an opportunity to blend with a new family and experience a new culture.